Working cooperatively over the last 4 months, the JAMA Editor Search Committee and the senior staff of the AMA have engaged in a productive dialogue and process to arrive at the best governance alternatives for the Journal of the American Medical Association and the Archives Journals. The purpose of this effort has been to insure editorial freedom and independence for JAMA, the Archives Journals, and their Editor-in-Chief. 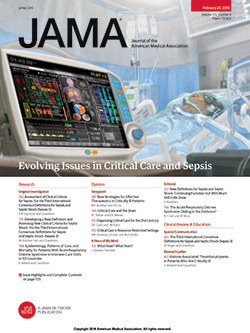 Editorial independence and journalistic responsibility continue to be hallmarks of the publications of the AMA, and insuring that valued tradition into the next millennium is of utmost importance. A structure by which to guarantee editorial independence, fiscal accountability, and journalistic responsibility has been achieved. A highly viable environment has been set for the next millennium, which will serve as a model for journalistic independence and freedom in the medical-scientific publishing world. For the last 116 years, JAMA has published the best in medical science and health care policy. JAMA, its editors, authors, peer-reviewers, and publishers have done much to advance the art and science of medicine and the betterment of the public health. We are all pleased to attest to this fact and to the Governance Plan of JAMA that guarantees its continued leadership. 1. There will be a seven (7) member Journal Oversight Committee (JOC). This committee will function and be recognized not only as a system to evaluate the Editor-in-Chief but also as a buffer between the Editor-in-Chief and AMA management and a system to foster objective consideration of the inevitable issues that arise between a journal and its parent body. 2. The JOC will prepare an annual evaluation of the Editor-in-Chief, which will be reported to the AMA executive vice president (EVP) and to the Board of Trustees of the AMA. The Committee will have the charge to evaluate the performance of the Editor-in-Chief on the basis of objective criteria, and deliver that evaluation on an annual basis to the EVP and Board of Trustees of the AMA. The JOC will be responsible for determining the criteria for evaluation of the Editor-in-Chief. These criteria will be established in writing and made available to each member of the JOC, the JAMA Editorial Board, the Editor-in-Chief, and the EVP and approved by the Board of Trustees of the AMA. The JAMA Editorial Board will be solicited for input to the evaluation process by the Committee. Correspondence about the performance of the Editor or JAMA received from constituent groups will be shared with the Committee. The Editor-in-Chief will be offered a 5-year contract. If the Editor-in-Chief is dismissed during the term of the employment contract, other than for cause, the contract will be paid in full. Should such dismissal occur in year 5 of the contract, the minimum payment to the Editor-in-Chief shall be 12 months' salary. 3. The JOC will be charged, in addition, with reviewing and, if necessary, making additional recommendations to the AMA EVP and Board concerning governance and structural reforms necessary to ensure the AMA Journals' editorial independence. For this purpose the Editor-in-Chief and VP for Publishing will serve as advisors to the committee. This function will be ongoing. 4. The seven members of the JOC will include one member of AMA senior management, one member from outside the AMA with publishing business experience, and 5 members representing the scientific, editorial, peer-reviewer, contributor, and medical communities. The Committee members shall serve 3-year staggered terms. A Committee member may serve no more than 2 terms. 5. No member of the JOC may be an AMA employee except for the member from AMA Senior Management. No AMA employee may be Chair of the committee, who shall be elected by the JOC. 6. Nominations for the first set of JOC members will be forwarded to the AMA Board by the Editor Search Committee which will also recommend the initial term of each member. 7. JOC members are to be selected by the AMA Board only from a list of recommended persons submitted by the JOC. Three names per position will be recommended by the JOC. In the event that the Board selects none of the 3, additional names would be recommended by the JOC, as necessary. Members of the JOC can only be appointed or removed by a 2/3 supermajority vote of the AMA Board of Trustees in the exercise of its oversight function. 8. Any proposal to dismiss the Editor-in-Chief for any reason shall be brought before the JOC for evaluation and a formal vote. The recommendations and views of the JOC shall be presented to the AMA Board along with the recommendation and views of the EVP. A supermajority (2/3) vote of the AMA Board would be required for dismissal of the Editor-in-Chief. 9. The Editor-in-Chief will continue to report to the Sr Vice President for Publishing and Business Services only for business and financial operations. The Editor-in-Chief will not report to management for any aspect of the editorial content of JAMA or the Archives Journals or other AMA publications under his/her jurisdiction. Editorial independence of the Editor-in-Chief will be absolutely protected and respected by AMA management. In order to exercise its evaluative functions, the JOC will have full access to financial information including revenue and expense statements, budgets, and actual results. In order to have access to this proprietary information each member of the JOC who receives it will execute the AMA's standard Confidentiality and Conflict of Interest Agreements.